The Contents of my Rucksack. 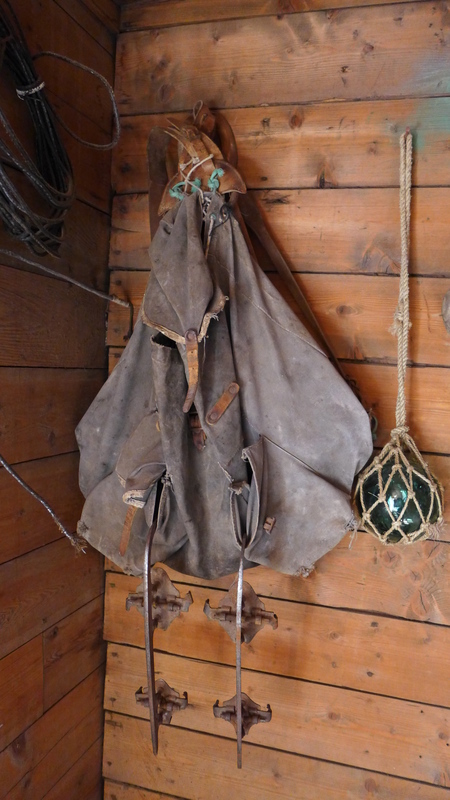 Fortunately my rucksack was a bit more modern than this one. Walking Socks x four pairs. Preferably 1,000 mile blister free socks. When I did the walk they only seemed available through mail order, but they are now in most outdoor shops. Preferably start the walk wearing two pairs (one thicker and one thinner pair) and, as the feet expand and harden, reduce to one pair. Razor – it is important to keep up appearances on a walk. Small toothbrush and toothpaste – available from the Body Shop. Alternatively break the handle of an ordinary toothbrush in half. Camera – preferably one that fixes to your belt so as to be readily available. Spare battery and charger. Memory Cards. Films (slides) x 2 for one week, x 4 for two weeks. (*authors update – I went digital in July 2006 and I am sure you will have done so by now!). Pen/pencil for writing your diary or postcards. Card with telephone number of next of kin – just in case! Change for coin box telephone (pre-mobile phones) / now replaced by a mobile phone and charger. With the above equipment it should be possible to walk for up to 200 miles between the middle of March and the middle of November, keeping the weight down to an acceptable 30lbs and at the same time enjoying the walk in comfort. With modern clothing you can keep warm and dry without carrying too much weight. My philosophy on walking is to be as comfortable as possible so that the scenery can be fully enjoyed. In recent years outdoor clothing has led many fashions and now, when going around town, it is impossible to tell the outdoor types from the fashion followers. However, you do not need an expensive waterproof jacket to walk round town; save it for when you are on the hills when its qualities will be fully utilised. My teenage children would never accept that much modern fashionable clothing developed from high-tech outdoors clothing. Even ‘bobble’ hats, first worn by walkers, briefly came into fashion amongst their age group! Apart from a waterproof jacket and over-trousers, a hat is the most important clothing as some thirty per cent of heat is lost through the head. Although hats are not a very fashionable item in the High Street, they are essential on the fells. It is a little unfortunate that many outdoor hats are designed with a big air space in the top, which makes you look as though you are walking around with the Empire State building perched on your head. Even the punk star, Sid Vicious, couldn’t compete with serious walkers in the number of zips he wore. On one occasion, to pass time in the pub, I counted thirty-three zips on my clothing. Most specialist walking clothing has zips in order not to lose all the essentials. Therefore, you can end up like a mobile zip factory. However, I have yet to meet a walker who has a safety pin or ring through his nose, lips or ear; they are better used for a temporary repair job on your trousers or for bandaging a wound. As I would supply and carry the maps and guide-book for the walk, Gary was asked to supply the First Aid kit, to include blister kits, Radian B, and Witch Doctor. The last three items cover most of the common ailments encountered on a long-distance walk, in fact Witch Doctor seems to sooth and treat nearly everything, chaffing, skin irritation, itching, insect bites, sunburn, minor burns, bruises, grazes, blemishes, infection, swelling, spots, although not a hang-over.